The Forevertron stands poised in a Wisconsin field. When the time is right—only Dr. Evermor will know when—the famous, enigmatic scientist will climb the winding staircase and enter its egg-shaped travel chamber, power up the dynamos and flip on the thrusters, and away he'll fly on a "highball to heaven," propelled by an electromagnetic lightning force beam. Or so the story goes. 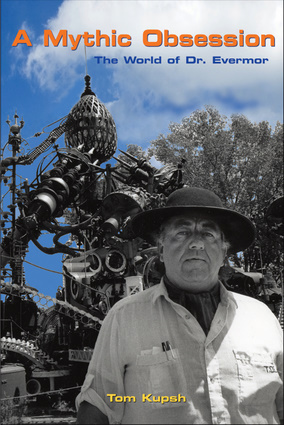 Anyone who's visited the elaborate visionary environment created by Tom Every has heard some variation of the Evermor myth. But few know the story behind the story, the fascinating history of this one-of-a-kind creative spirit. From a very early age Every collected, modified, and resold cast-off industrial material. His work as a salvager led him to Alex Jordan Jr., creator of the House on the Rock, where he collaborated with Jordan on many of the attraction’s most elaborate displays. After the two parted ways, Every began to explore his own artistic voice. In addition to hundreds of whimsical welded sculptures, he poured most of his effort into the Forevertron, the world’s largest sculpture built by a single person. In the process, Every discovered his alter ego: Dr. Evermor. Author Tom Kupsh, with the full participation of Tom and Eleanor Every, has keenly documented Every’s amazing life, including never-published family photos, sketches, and personal memories. What emerges is a detailed portrait of a unique, self-taught artist. Tom Kupsh originally met Tom Every in the 1970s, and they reestablished their friendship years later. He is the former creative director for House on the Rock and lives in southern Wisconsin.